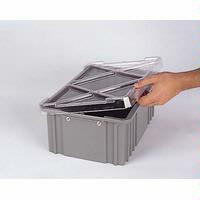 These divider boxes are well-suited for storing large bulk items or small, fragile parts. Bottom - 9.8" x 7.3" Top - 9.2" x 6.6"
Sold in Package Quantities Only! Subdivide Lewis Bins Divider Boxes with this short divider to increase part protection and prevent part migration. Heavy-Duty Snap-On Solid Covers are durable covers that fit securely on the container to conceal and protect contents. 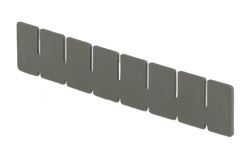 Snap-On Cardholder is envelope style and available with one or two snaps. Clear window with solid back.